Take It Up Wear It Out: Invisible mending for smart clothes: quick fixes to stop a small problem becoming a big project! Invisible mending for smart clothes: quick fixes to stop a small problem becoming a big project! It’s probably happened to all of us. We’re happily going about our business, in a seemingly well-fitting piece of clothing. Then we bend down suddenly or hop up to perch on a high chair and hear that telltale krrrrrrrk of ripping fabric, or feel a breath of chilly air on a previously well-covered part of our persons. If our clothes are particularly sneaky, we won’t notice at all until someone points it out to us. If we’re dressed smartly, we’ll probably sidle around with a jumper tied around our middles until we can scurry home to change. What happens to these clothes now? Can they be saved, or do we have to send them to textile recycling? Casual clothes are easier to repair; a visibly patched pair of jeans will probably look more on-trend than they did when they were brand new, and knitwear or dresses can be embellished with embroidery to disguise holes. Smart clothes can be a different story (especially if there is a dress code to follow), and if clothes have torn in an area you’d rather not draw attention to, your options are either refashioning, or invisible mending. This loose-fitting dress apparently wasn’t loose-fitting everywhere, as it split right across my bottom while I was at work! This is a good illustration of why we shouldn’t take fit issues that lead to rips in our clothes too personally; problems with the pattern, manufacture, or faults in the fabric itself are most likely to contribute to a lack of “ease” that allows clothes to move with our bodies. 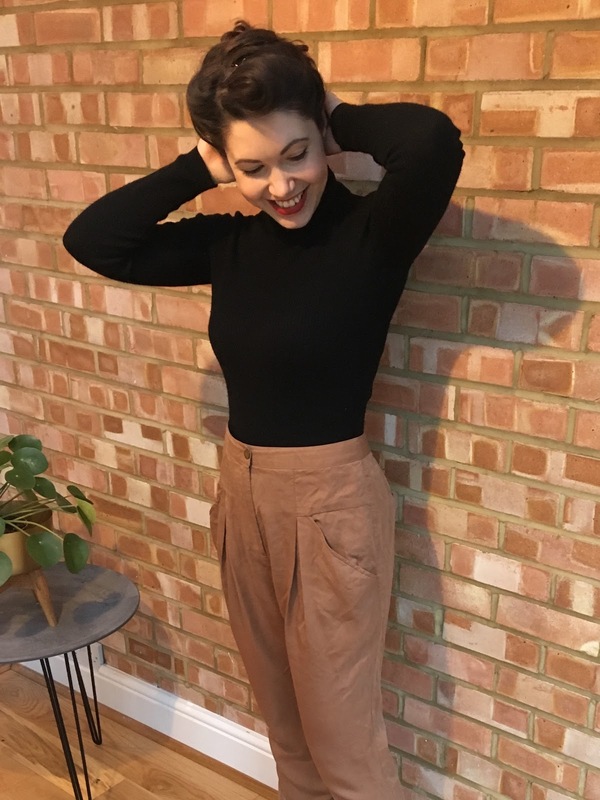 Because of the position and size of the tear, I decided to refashion the dress into a top, but I realised I could use the fabric to save a pair of trousers (made by the same brand, from the same fabric) that were destined for a similar fate. A key part of looking after clothes is actually to look at them; give them a once-over after washing, or while you are putting them away. It’s much easier to reinforce an area that looks a bit threadbare than to repair a big rip or tear. This small ladder in the fabric doesn't look like much of a problem now, but because it’s right on the crotch seam, I wanted to repair it straight away, before it got any worse. Using the fabric I cut from the bottom of my tunic dress, I cut a patch to reinforce the trousers from the inside. Using pinking shears means the edges of the patch won’t fray, and I cut the patch on the bias (following a diagonal line across the fabric, rather than the vertical or horizontal lines of the warp and weft threads of a woven fabric) so it will have a bit of “give” in it. If you don’t conveniently have a piece of matching fabric to hand, most fabric shops will sell a 10cm wide piece as a sample, or send you a swatch that is approx 10 by 10cm for around £1. I pinned the patch on the inside of the trousers, then turned them the right way out to stitch the patch down. This doesn’t require a special technique, just a running stitch around the hole or ladder (I usually do several rows or concentric circles to make sure the patch is secure). I also stitched the loose threads in the ladder down to the patch to stop them from catching on anything or pulling further. I was in a mending mood, so I also darned the underarm of a black roll-neck sweater (underarms are another area where I prefer an invisible mend). Mending yarns for fine, shop-bought machine knits are available from haberdashery shops in a range of colours. There is a great darning tutorial in the Fashion Revolution zine Loved Clothes Last; it works for visible or invisible darning, just choose the colour of your yarn! 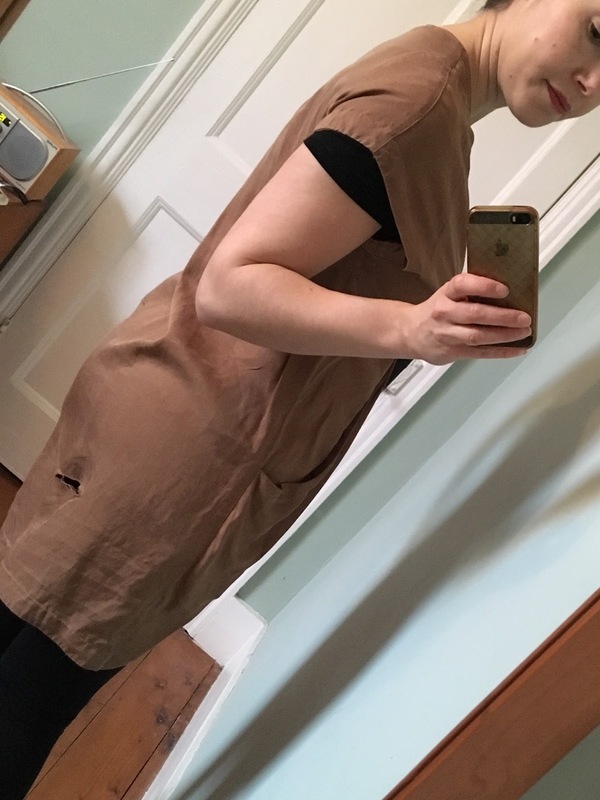 Looking at the photos I’d taken of the tunic dress to show the rip, I realised the style was actually quite unflattering on me. I unpicked the gathered elastic band, and cut a triangular underbust panel from the piece I’d cut from the bottom, to give the top more of a vintage look. I also cut two strips which I made into waist ties so I can cinch the waist in a bit. I topstitched the new panel onto the dress, catching the waist ties on at the side seams, then folded the top of the pocket panel down and stitched it in place. I finished the top by hemming it; I only used a small hem allowance because I wanted to keep as much length in the top as possible, and I did have to shorten the pocket bags slightly so they wouldn’t hang out from under the hem, but I’ve managed to turn something that was unwearable in its broken state into something I’ll want to wear again. Hopefully my newly-mended sweater and trousers will remain intact for the foreseeable future: they had both been out of circulation for quite a while because they needed mending and now I just wish I hadn’t put it off for so long; these mends are quick and hassle-free! There’s no sewing machine required, and I was able to work with one eye on the TV. If you have clothes that aren’t quite up to scratch, why not put aside a couple of minutes this weekend to do a quick repair, and reunite yourself with a favourite piece of clothing.